Two reports out this week paint an alarming future for Earth’s oceans. The first one, published by the Wold Economic Forum, finds that by 2050, the oceans will contain more plastic than fish by weight. The second, which appears in Nature Communications, reveals that our nets have raked in far more fish over the past 60 years than we realized. “This is a huge problem and a distributed problem,” Jackie Savitz, vice president of US Oceans at Oceana, told Gizmodo. Savitz added that while nobody knows exactly how much plastic is entering the ocean, or how many fish are leaving it, she “wasn’t at all surprised by the numbers” that surfaced this week. The plastics report, which can be downloaded in its entirety here, was produced by the Ellen MacArthur Foundation, based on interviews with over 180 experts in the plastics industry. It found that a staggering 32 percent of all plastics we produce escape any collection system—finding their way into rivers, lakes, and the ocean—while only 14 percent of plastic is collected for recycling even once. More plastic is entering the ocean every day, mostly, due to the growth of plastics production in “high leakage markets”—developing countries with inadequate waste management. Each year, at least 8 million tonnes of plastics leak into the ocean – which is equivalent to dumping the contents of one garbage truck into the ocean every minute. If no action is taken, this is expected to increase to two per minute by 2030 and four per minute by 2050. The best research currently available estimates that there are over 150 million tonnes of plastics in the ocean today. 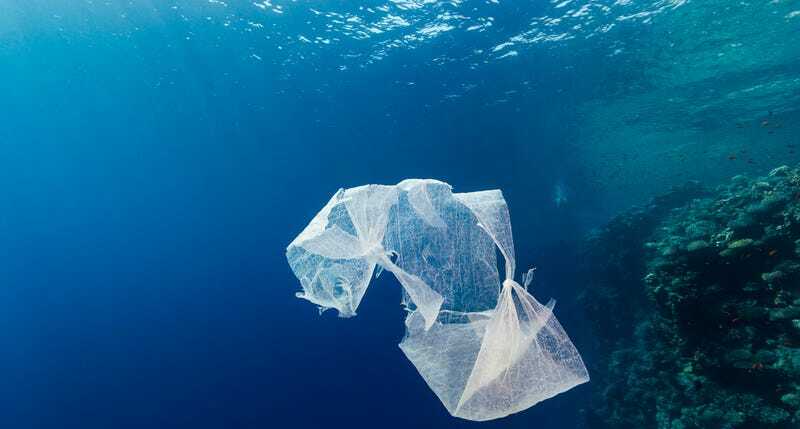 In a business-as-usual scenario, the ocean is expected to contain 1 tonne of plastic for every 3 tonnes of fish by 2025, and by 2050, more plastics than fish (by weight). This sounds pretty dire, but the prediction that ocean plastic will outweigh ocean fish 35 years from now may be conservative. That’s because the report assumes the amount of fish in the ocean will stay constant. Another large meta-study published this week suggests otherwise. Writing in Nature Communications, Daniel Pauly and Dirk Zeller of the Global Fisheries Cluster at the University of British Columbia find that over the past 60 years, global fishery catches have been chronically underreported, with over 50 percent of the fish our nets rake in (by weight) going unaccounted for. Contrast between the world’s marine fisheries catches, assembled by FAO from voluntary submissions of its member countries (‘reported’) and that of the catch ‘reconstructed’ to include all fisheries known to exist. Caption and image via Pauly and Zeller 2016. How can this be? Global statistics on marine fishery catch rates are compiled each year by the Food and Agriculture Organization (FAO), which relies on official data submitted by member countries. Unfortunately, many nations routinely omit small-scale commercial and subsistence fisheries, focusing only on large, industrial operations. And even when it comes to big commercial fisheries, discarded by-catch and illegal fishing often go unreported. Fisheries data assembled by the Food and Agriculture Organization (FAO) suggest that global marine fisheries catches increased to 86 million tonnes in 1996, then slightly declined....We suggest that catch actually peaked at 130 million tonnes. In a more positive development, Pauly and Zeller found that catch rates are now declining faster than the FAO estimates, by approximately 1.2 million tons per year instead of 0.38 million tons. Whether this downward trend will continue is uncertain. As the global population booms, marine life faces increased pressure from hungry humans—and whether or not we’ll pick the oceans clean depends entirely on how we manage what’s left. Which brings me to why we shouldn’t just throw our hands up in despair: there’s still time to prevent the oceans from transforming into a lifeless dumpster. “One of the thing that strikes me is when we give people opportunities to make better choices, they take them,” Savitz said. Entire industries are already cropping up around the collection and re-use of discarded plastic, and that’s a trend that’s only going to continue. Meanwhile, the United States and other nations with large commercial fishing fleets have begun using scientific tools to estimate exactly how many fish can be sustainably harvested from a given population each year. We’re seeing nations make a concerted effort to conserve, and when that happens, fish populations bounce back. As Savitz pointed out, a mere 30 nations account for roughly 90 percent of the fish harvested from the ocean. “If we can get sensible, sustainable policies in those 30 countries, we can start to see fisheries recover,” she said. Those policies include adhering to scientifically-based fishing limits, minimizing the amount of by-catch, and protecting habitat and spawning areas. “Over time, we could even end up with more fish than we have today,” she added. There’s no denying the oceans are in dire straits, and it’s going to take a lot of action, from consumers to national policy makers, to clean them up. But the fight is only over if we say it is.